To commemorate one of the most important events in Irish history –the end of the Irish Free State and the creation of the New State of Ireland - a Limited Edition commemorative medal has been issued. Reserved for you: The Michael Collins Commemorative Medal - paying tribute to one of Irelands greatest statesmen. 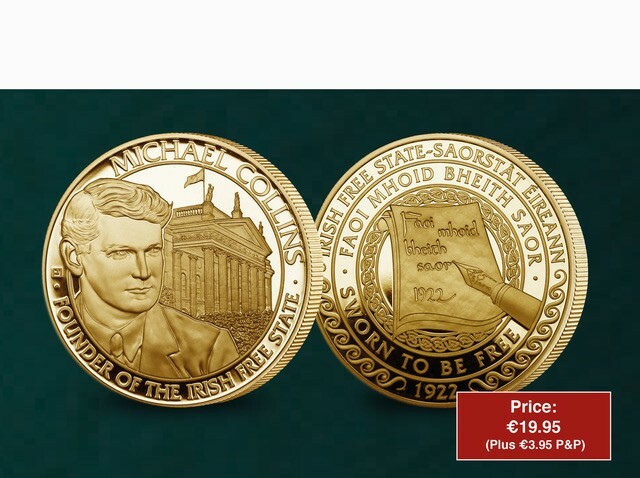 When you order your limited edition gold layered Michael Collins 80th Anniversary Medal for just €19.95, you qualify to receive the remaining five medals, without any risk or obligation. These will be delivered to you in convenient monthly intervals for just €29.95 each (plus €3.95 P&P), always on approval. You may stop collecting at any time. All purchase are protected by The Dublin Mint Office 14 day ‘no quibble’ returns guarantee. Guaranteed access to the Building the New Ireland Medal set.